Description: People v. Jones FIRST DIVISION December 26, 2006 No. 1-05-0725 THE PEOPLE OF THE STATE OF ILLINOIS, Plaintiff-Appellee, v. KELVIN JONES, Defendant-Appellant. Appeal from the Circuit Court of Cook County. No. 04 CR 12194 Honorable Thomas R. Sumner, Judge Presiding. Description: People v. Jones SECOND DIVISION February 6, 2007 No. 1-05-0219 THE PEOPLE OF THE STATE OF ILLINOIS, Plaintiff-Appellee, v. CARRANZ JONES, Defendant-Appellant. Appeal from the Circuit Court of Cook County. Honorable Clayton J. Crane, Judge Presiding. Description: FIFTH DIVISION August 10, 2007 No. 1-05-0020 THE PEOPLE OF THE STATE OF ILLINOIS, Plaintiff-Appellee, v. LARRY JONES, Defendant-Appellant. Appeal from the Circuit Court of Cook County Honorable Rickey Jones, Judge Presiding. Description: SIXTH DIVISION August 10, 2007 No. 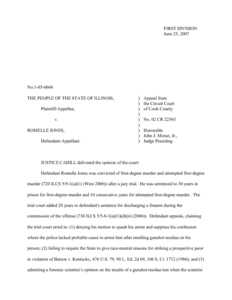 1-05-3883 THE PEOPLE OF THE STATE OF ILLINOIS, Plaintiff-Appellee, v. TERENCE JONES, Defendant-Appellant. Appeal from the Circuit Court of Cook County, Illinois. No. 04 CR 13669 (03) Honorable Stanley J. Sacks, Judge Presiding. Description: No. 2--05--1135 Filed: 11-14-07 In The Appellate Court Of Illinois Second District The People Of The State Of Illinois, Plaintiff-Appellee, v. ALLEN B. JONES, Defendant-Appellant. Appeal from the Circuit Court of Du Page County. No. 04--CF--2332 Honorable George J. Bakalis, Judge, Presiding. Description: No. 3-07-0006 Filed October 21, 2008 In the Appellate Court of Illinois, Third District, A.D., 2008 PEOPLE OF THE STATE OF ILLINOIS, Plaintiff-Appellee, v. SHONE L. JONES Defendant-Appellant. 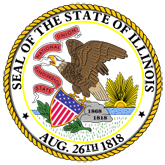 Appeal from the Circuit Court of the Tenth Judicial Circuit Peoria County, Illinois No. 05-CF-351 Honorable Scott Shore Judge Presiding.